A recent 2013 HubSpot Inbound marketing report (on content marketing) shows the clear impact of regular quality content on lead generation and sales. Content inspires confidence. [Click To Tweet]. 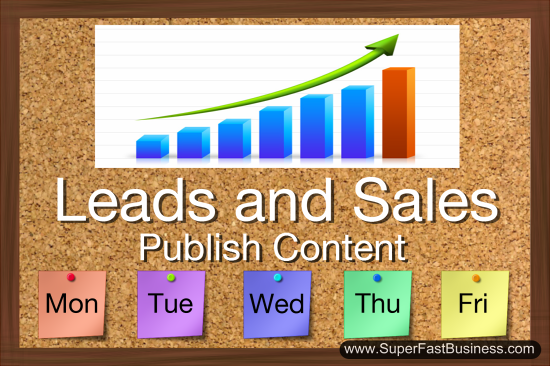 Generate more leads and sales with great content. [Click To Tweet]. James Schramko here, and today I want to talk to you about content and some of the findings from the 2013 Inbound Report that HubSpot put out. It looks like content inspires confidence. Sixty-one percent of the survey respondents said that they feel better about a company who is putting out custom content on a regular basis, that they would be more likely to purchase from that company. And did you know that entrepreneurs who publish a blog get 67% more leads every single month than entrepreneurs who do not publish a blog? So it’s pretty clear that custom content is more important than ever. So the action step for today is to review your content schedule. Do you have a blog? Are you publishing content regularly? And is it customized and useful for your audience? Chances are, if you’re doing that, then you are going to get more leads, and your customers are going to buy more from you. Now while I was away for most of last month, I still managed to generate nearly a thousand leads to my blog even though at times I had almost no Internet. And that is because the blog content is working even when I’m not. Someone is going to find this post, this video, this audio, this text, this picture, that you’re watching or listening or reading right now, at some point in the future. And it will still lead off to my products and services. That’s how content marketing works. It is the marketing channel that pays long term dividends. So get your thinking hat on, make some great content. If you haven’t already done it, make sure you watch the Own The Racecourse training. Just go to OwnTheRacecourse.com and download the entire training. It’s also on iTunes for your convenience. And see how to come up with ideas and how to publish it. If you need help with your website, then ask my team to build your website, or to create content for you. So everything you need is at your fingertips. It make sense to be doing content marketing. It is definitely the way forward, and you’re going to pick up oodles of search engine optimized traffic. Well I hope you’ve found this useful. I’m James Schramko, I look forward to catching up with you in a future episode. James, can you share your content publication schedule? How many posts per week, what days you’ve found best and what specific content on those days? All while relating it to OTR. Love to see that in a future post. Publish as much as you can whenever you can. It’s so refreshing to hear established professionals in the industry talking about the importance of content. I’m 100% with you James. A great piece of advice I once heard was. . . . “Publish as often as you have something valuable to share.” And then there is Seth Godin who said . . . “Everyday you should be publishing your best stuff.” I don’t believe you can go wrong with either one of these content publishing philosophies. James! Just saw your silvercircle videos and man you get mad props. You’ve really stepped it up! Looking forward to stalking you!